You are here: Home > Do C-sections “cause” childhood asthma? Do C-sections “cause” childhood asthma? If there is one thing that drives me crazy about contemporary medicine, it is the propensity for doctors and scientists to announce “causes” and “cures” long before definitive data exists. Scientists are often promoting their own discoveries, but doctors have no such excuse. Allowing preliminary results to influence clinical recommendations is not only harmful to patients, but it destroys the credibility of doctors. The single biggest mistake doctors make, is the same one that journalists and laypeople make. Correlation is not causation. We know how to determine the difference between the two, but unfortunately some doctors, and almost all journalists as well as most laypeople, don’t wait for the appropriate scientific evidence before declaring the discovery of a correlation means that a cause has been found. The latest such mistake is occurring in obstetrics, where a correlation between C-section and childhood asthma, has led to the premature declaration by some that C-sections “cause” childhood asthma. There’s even a hypothesis that’s supposed to account for the causative link, the “hygeine hypothesis,” but that is nothing more than a hypothesis at this point. Of course, natural childbirth and homebirth advocates never miss an opportunity to demonize C-sections. Hence today’s guest post on Science and Sensibility by Dr. Mark Sloan, Unintended Consequences: Cesarean Section, The Gut Microbiota, and Child Health. Humans evolved right along with the gut microbiota normally acquired during vaginal birth. When the composition of the microbiota is imbalanced, or unusual germs like Clostridium difficile appear, the immune system doesn’t like it. A low-grade, long-lasting inflammatory response directed at these intruders begins at birth, leading to a kind of weakness and “leakiness” of the intestinal lining. Proteins and carbohydrates that normally would not be absorbed from the intestinal contents—including large, incompletely digested food molecules—make their way into the infant’s bloodstream. To make a very long story short, inflammation and the abnormal processing of food that results appear to increase the risk of asthma and eczema—and diabetes, obesity, and other chronic conditions—later in life. What might be confounding factors in a correlation between C-sections and asthma? There are lots of possibilities, and each can and should be investigate before anyone suggests that C-sections cause childhood asthma. Asthmatic children had significantly lower umbilical artery pH values at birth than nonasthmatics, even after adjusting. 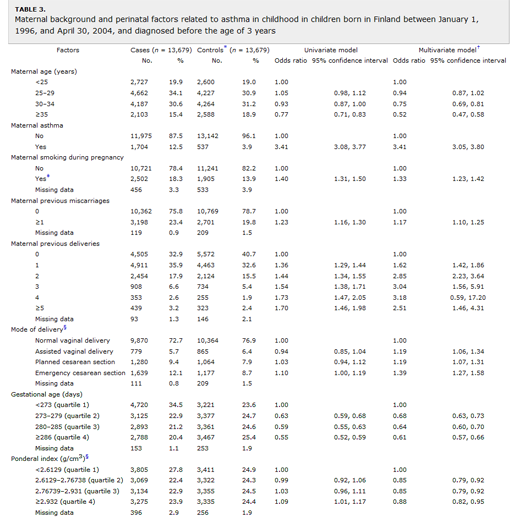 Children who were born with pH values of 7.20-7.25 had a 2.62-fold (95% confidence interval [CI], 1.31-5.23) higher risk of asthma and children who were born with umbilical arterial pH values ≤7.19 had a 3.22-fold (95% CI, 1.51-6.87) higher risk of asthma than children who were born with umbilical arterial pH values of 7.26-7.30. In contrast, children who were born with umbilical arterial pH values ≥7.30 had a 0.41-fold lower risk of atopic eczema than children who were born with umbilical arterial pH values of 7.26-7.30. No such association was detected between umbilical artery pH values and allergic rhinitis. Similarly, Tollanes et al. noted that children born by emergency C-section had a higher risk of childhood asthma than children born by planned C-section.These findings suggest that it is not mode of delivery, but rather the presence or absence of oxygen deprivation prior to delivery that increases the risk of childhood asthma. Children with at least 1 atopic parent who were born vaginally at home had a lower odds of having asthma than children born vaginally at the hospital (reference category; aOR, 0.47; 95% CI, 0.29-0.77; Table IV). The risk of asthma for children born by means of cesarean section did not differ significantly compared with that of children born vaginally in the hospital. These associations were absent in children without atopic parents. In other words, mode over delivery had no effect on the incidence of childhood asthma, but place of delivery (home vs. hospital) had an effect, but ONLY on children with at least one parent who had asthma or similar sensitivities. The role of antepartum and intrapartum antibiotics must also be accounted for in future studies. What effect, if any, these antibiotics have on the microbiota of the fetus and/or subsequent development of disease is unknown. Nearly 20% of women in the United States are colonized with group B streptococci and subsequently receive intrapartum antibiotics. The standard of care also dictates that antibiotics be administered before CD and to mothers in preterm labor and/or with premature prolonged rupture of membranes. Given all these facts, the exposure to antenatal antibiotics is significant. 4.. Other factors entirely. Metsala and colleagues looked at a wide variety of factors and found only a weak association between mode of delivery and childhood asthma. Other factors, such as maternal history of asthma had a much stronger assosciation. Maternal asthma was the strongest predictor of asthma in children diagnosed before the age of 3 years (odds ratio (OR) = 3.41, 95 percent confidence interval (CI): 3.08, 3.77)… In the multivariate model, maternal age, asthma, smoking during pregnancy, and previous miscarriages as well as previous deliveries, both planned and emergency cesarean sections, gestational age, and ponderal index were associated with the risk of asthma in children diagnosed before the age of 3 years. The literature on the correlation between C-section and childhood asthma is conflicting. The correlation may be real, weak or non-existent. 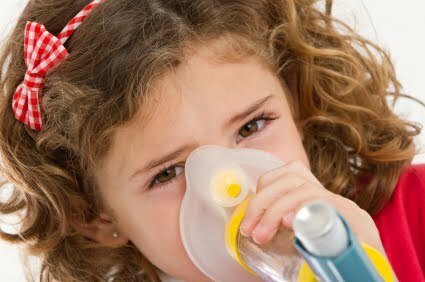 The correlation between maternal or paternal asthma is much stronger than the correlation between mode of delivery and childhood asthma. After correction for confounding variables such as parental asthma, smoking history and the presence of absence of fetal distress, the correlation between C-section and childhood asthma is greatly reduced of disappears altogether. The hygeine hypothesis is only a hypothesis. It has not been confirmed in either population studies or experimental studies. To the extent that gut microbiota may be implicated in childhood asthma, the use of antibiotics before and during labor would have a major impact, yet this has not even been studied. In other words, it is premature to declare that C-sections increase the risk of childhood asthma. The only definitive statement that can be made at this point is that some studies show a correlation, others do not, and that the role of confounders has not been fully elucidated. It’s three years later and the “mounting” evidence you spoke of has failed to mount. But let’s pretend that it HAD mounted. There would still be a huge problem with what you’re saying, because you fail to mention that vaginal births are also “not as benign for babies” as natural childbirth advocates believe. Shoulder dystocia, cord compression, placental abruption, etc…. Most mothers-to-be genuinely don’t know that vaginal birth can cause babies to suffer permanent nerve damage, including permanent partial paralysis; that it can cause brain damage; that it can cause death. You do know that (I assume, since you’re an MD), but you leave that information out of your articles. And yes, those events are rare. But to make the point you are trying to make in an HONEST way, you would have to state, on the one hand, the statistical risk of asthma and eczema attributable to c-sections… and on the other hand, the statistical risk of nerve damage, brain damage or death attributable to vaginal birth. Put BOTH sets of numbers in front of pregnant women and let them decide. Instead, you’re making vague allegations about asthma and eczema–necessarily vague, since there is no evidence that c-sections cause either problem, much less solid evidence with numbers attached–and implying (falsely) that vaginal birth, even vaginal home birth, poses no risk at all. That’s simply dishonest.